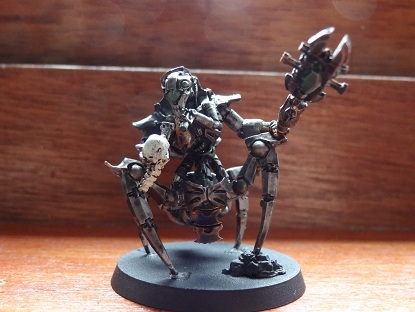 As you know, I'm rather a big fan of Fantasy's range of plastic characters, and I already converted the plastic Necromancer into a Sanctioned Psyker. 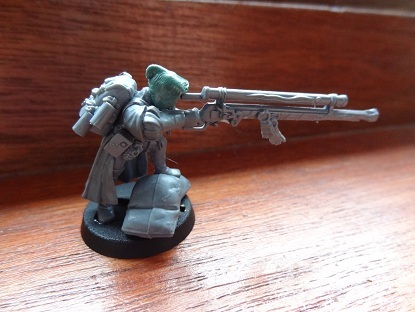 I decided to do it again, this time converting the Empire Master Engineer into a Malleus Inquisitor with hellrifle. For comparison, let's look at the original model. Used for comparison purposes only. I'll tell you what needs to go after the jump. Right, first off, the hat. It's stupid, get rid of it. Next, the stand. 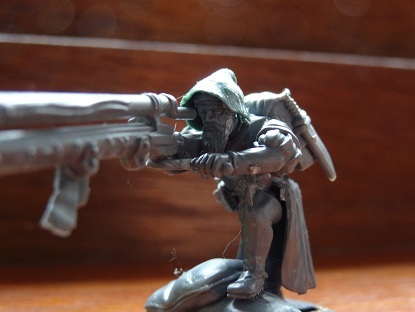 Real men of the Inquisition can lift their guns properly, plus the Hellrifle only looks like an antique and therefore doesn't suffer the pitfalls of old-style guns. I also need to get rid of the square base, the cannonball he's standing on and the brace of pistols. I'll keep the sleeves as they fit the Exercitus' old style aesthetic. The last thing to go is the silly fan-shaped thingy on the end of the gun. The first obvious thing I wanted to do was find him something new to stand on, as there's no way I'm skilled enough to repose legs. Thankfully, I had loads of Imperial Guard sandbags lying around, which were the perfect height. The gun stand is gone, with only a purity seal left where it once was. A small pouch and grenade were enough to emphasise he has access to mod cons and isn't just an Empire guy in the wrong era. Finally, to balance out the model and not make him look too back-light, I added a rucksack of usefulness and the normal Exercitus hood. And that's pretty much all I want to do with him. Oh, I did another bunch of stuff too. This is Illuminor Szeras drying out from a ink splattering. I'll need to touch him up a bit, but other than that he's ready to go. I've decided that the best way to clear my backlog is not to be looking at it all the damn time. 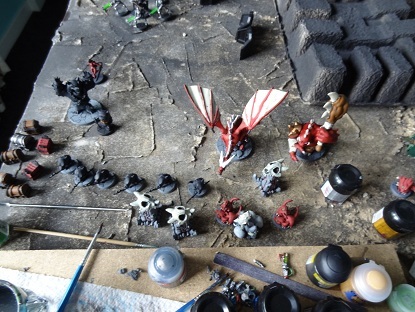 Since the last Super Dungeon Explore update, I've 90% completed the second Kobold Ogre, done a little more work on Starfire and finished the Riftling Rogue, who I'll show off soon. 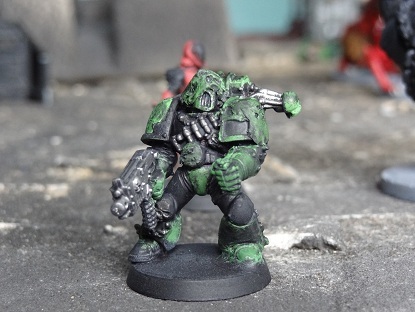 I also did a little more test painting on this Plague Marine. This minimalistic scheme reminds me a lot of the original Angels of Secrecy colours. Since I don't want to go to town on plagueyness, I might just adopt this as a quick scheme I can use to finish the Plaguey Plaguedudes quickly. Even then I'll probably never use them as Troops, sadface.